In this traumatic brain injury case, Kevin W. Mottley and Benjamin P. Kyber of The Mottley Law Firm teamed up with Stephen M. Smith and David B. Holt of The Brain Injury Law Center in Hampton, Virginia, to represent a 54-year old woman who suffered a traumatic brain injury in a head-on collision car accident. What made this case so challenging was the client's prior medical history, which was considerable and very complicated. Prior to the collision, the client (who will be referred to as "Becky" to protect her identity) suffered from a decades-long history of psychiatric problems like anxiety and depression. She had a decades-long history of migraines. She had struggled greatly in school as a child. She'd been diagnosed by her psychiatrist as having Asperger Syndrome. She was on the "autism spectrum." Several years before the crash, she had a TIA episode. Becky had also suffered a prior head injury when she fell from a horse. And she had previously been diagnosed by a doctor in the emergency room at Henrico Doctors' Hospital as having suffered a concussion when her son accidentally slammed a hatch-back door on her head when she was unloading groceries from her car. Finally, Becky was on disability from her psychiatric problems, and was unemployed. Here's what happened in the car accident that led to the lawsuit. On May 31, 2015, Becky was driving from her house in Goochland County, Virginia toward Richmond on Route 250, or West Broad Street. She was driving about 55 miles per hour, the posted speed limit in that area. As she approached the Hickory Notch Grille located at 2031 Broad Street Road, Maidens, Virginia, another car being driven west bound on Route 250 (in other words, the opposite direction to Becky) was preparing to make a left hand turn into the restaurant parking lot. The driver of the other vehicle apparently did not see Becky's car approaching, and suddenly turned into the path of Becky's car. Becky's car slammed into the passenger side door of the other driver's car, resulting in a violent collision. Becky's airbags deployed. But as you might imagine, Becky's head slammed forcefully into the airbag. When something like this happens at a high speed, a "coup" and "contrecoup" injury happens to the brain. A "coup" injury happens when the brain moves within the skull toward the site of the impact. In this case, that was where the airbag hit Becky on the right side of her face. 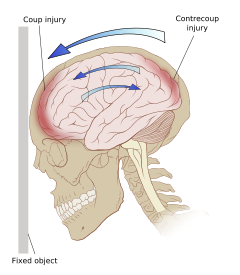 A "contrecoup" injury happens when the brain then moves back in the opposite direction from the impact, thereby moving toward the other side of the skull. This sort of back and forth mechanism of injury causes a cerebral contusion in which the brain is bruised. At a microscopic level, the cells in the brain are damaged when this happens. Becky vaguely recalls the seconds prior to the collision, but that is about it. Her next memory, which can be characterized as a "fleeting" memory, was of yelling at someone who came to her driver's side window after the crash. The other driver, who caused the crash, got out of her car and went over to Becky's car to see if she was injured. She yelled several times at Becky, "Ma'am, are you ok?" Becky did not respond. On the third attempt, Becky finally responded to her by yelling, "I've been in an accident." The other driver then called 911 for an ambulance. When the 911 operator asked the other driver whether anyone was injured, the other driver told the 911 operator that she thought "the other lady is in shock." Becky remembers none of this. Becky's first real memory was of being lifted onto a gurney at MCV Hospital in downtown Richmond, where she was taken by ambulance. Becky was suffering from a lot of pain in her back and in her hip. But she was also suffering from headaches. MCV kept her at the hospital for a couple of days to make sure she was stable, but then she was discharged. It did not take Becky and her live-in boyfriend very long to realize that something was not right. Becky was having lingering headaches from the accident, but she was also having difficulty concentrating, focusing, and seeing things properly. Added to this were balance and dizziness problems, as well as chronic fatigue. Although Becky had previously been prescribed glasses, she'd never experienced vision issues like this before. As time went on, Becky continued to have these problems on top of her pre-existing depression and anxiety she had been dealing with for years. The doctors who continued to treat her at MCV Hospital, as well as her treating psychiatrist who had been treating her for anxiety and depression, recommended that Becky undergo a neuropsychological evaluation by a professional neuro-psychologist at VCU. Becky did this. The evaluation showed that Becky was experiencing cognitive deficits as a result of the traumatic brain injury she suffered in the crash. Becky was then referred to a psychiatrist who specializes in brain injury medicine, who enlisted the help of an optometrist who specializes in detecting problems with the eyes from brain injury. The optometrist found that Becky was suffering from convergence insufficiency, meaning that Becky's eyes are unable to work together when looking at objects. Based on this and other tests that he ran, the brain injury medicine specialist concluded that Becky was suffering from a traumatic brain injury, post-traumatic stress disorder ("PTSD"), post-traumatic vision syndrome ("PTVS"), convergence insufficiency, cognitive communication disorder, dysexecutive disorder, orbitofrontal deficits, post-traumatic headache syndrome, a balance disorder, and a disorder of initiating and maintaining sleep from the car accident. Although Becky clearly had a lot of problems resulting from the crash, the reality was that Becky already had a lot of problems from before the crash. So, what was caused by the crash, and what was there before the crash? That was the big question in the case. On this issue, Becky's doctors felt that the car crash was the main cause of her problems and that the TBI she suffered in the crash was actually aggravating and exacerbating her pre-existing conditions. Her long-time treating psychiatrist, for instance, believed that her Aspeger Syndrome actually made it more difficult for her to cope with and heal from the TBI, as did her pre-existing depression and anxiety. But the medical experts hired by the defendant in the case disagreed. They contended that Becky's problems were all related to her pre-existing conditions, and that any effects of the traumatic brain injury had resolved within weeks of the accident. In addition to this, the pre-existing problems that Becky had experienced, coupled with Becky already being on disability as a result of her anxiety and depression, were significant challenges to overcome in her lawsuit arising from the crash. About a month before the trial was scheduled to begin, the other driver admitted that she was at fault in causing the crash. So the only issue for the jury to decide in the trial was what amount to award Becky for her traumatic brain injury. The parties had a mediation with a retired judge from The McCammon Group in Richmond, Virginia. During the mediation, which lasted an entire day, Becky decided to settle her case for $630,000 to remove any risk that she might receive a low award from a jury in a lawsuit.